Frenchy and the Punk's newest album delivers a rocking combination of attitude and whimsy. I recall the first time I saw Frenchy and the Punk, years ago at Dragon Con. 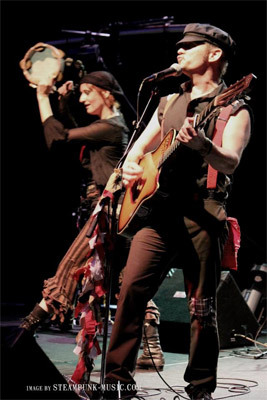 I was floored by the amount of sound pouring forth from just two people: lithe vocalist “Frenchy” Samantha Stephenson and acoustic guitar-slinging “Punk” Scott Helland. They stirred the crowd into a frenzy with their potent blend of live percussion, layer-looped guitar riffs, and ridiculously catchy lyrics. Frenchy and the Punk at Dragon Con. As amazed as I was by the dynamics of their live performance, I wondered how they could ensnare that musical spirit and vibrant personality within a mere recording. Well, they managed to do just that on their previous vocal albums Hey Hey Cabaret and Happy Madness, two albums that have lived on many of my playlists. Now they've succeeded again with their newest album, Bonjour Batfrog. The eleven tracks aboard the album showcase both the band's whimsical nature and its love of art and artists in all forms. The collection kicks off with the dark, swaggering "Fe Fi Fo Fum", an earwig of a track that's sure to be a live show crowd pleaser. It's followed by the sly and sensual "Strangers After Midnight", a drum-and-riff stroll through the underbelly of Paris. The song highlights the duo's ability to paint vivid visuals with carefully chosen lyrics and Stephenson's sultry delivery. I admit, when I first listened to the next track "Bringin' Out The Dead (Edward Gorey Seance)" I didn't recognize Mr. Gorey's name, aside from a reference in FATP's older song "House of Cards". Little did I know I'd been a fan of Gorey since I was a child, when I would watch the Vincent Price-hosted Mystery! series on PBS and be enchanted by its whimsical black and white opening Gorey animation. I'd simply never known the artist's name. Of course, I had to research more of his art, and found that Frenchy and the Punk's song perfectly captures his comedically morbid vision. The band's tributes to visual artists continue in the dreamlike "Forever and Ever MC Escher", a smooth, catchy ode to the epynonymous artist, known for his reality-bending art. The lyrics suggest a playful romance--or simply an appreciation of the artist--via the imagery of Escher's most famous works, such as his infinite stairways and "My hand drawing your hand drawing mine." It's a delightful song, and easily one of my favorites on the album. The band ratchets up the rock on tracks like the Helland-sung "Don't Fear the Rabbit" and the fatalistic "Why Should I". Female empowerment takes center stage in the songs "Batgirl" and "She Was a Flapper (Ode to Lois Long)", the latter proudly declaring "Success is the best revenge" in honor of the 1920's New Yorker columnist. The band's also not afraid to slow it down. On the ballad "Carried Away", Helland trades his acoustic punk guitar riffs for delicate picking, creating a soft foundation for Stephenson's gentle vocals. I've always felt there are two main kinds of steampunk bands: ones that sing about steampunk worlds, and others that seem to inhabit them. Frenchy and the Punk are the latter. Bonjour Batfrog, and their music overall, feels like something you would hear on the streets and in the clubs of an alternate past. This is a strong album that finds balance between aggressive shout-alongs, and their more introspective--yet no less fun and energetic--looks into their artistic and historical interests. It's a good time, and I highly recommend it to steampunks everywhere.